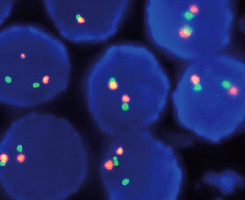 Tissue section showing HER2 gene amplification/cluster (Orange) CEN 17 (Green). Normal interphase cells, SPEC HER2 Probe map (not to scale). 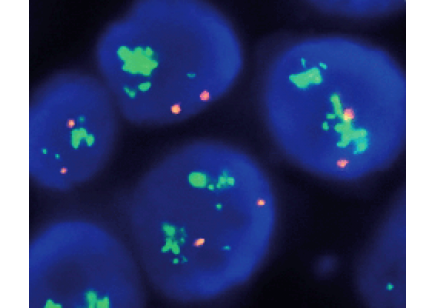 HER2 gene amplification frequently observed in solid malignant neoplasms. 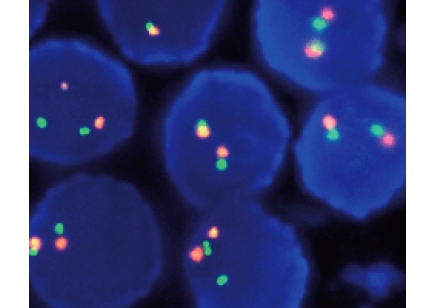 eFISH HER2/CEN 17 Dual color Probe has affinity to HER2 gene. The HER2 gene (a.k.a. ERBB2 and NEU) is located in the chromosomal region 17q12 and encodes a 185-190 kDa transmembrane glycoprotein, p185, acting as a cellular growth factor receptor. 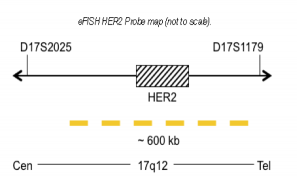 The use of eFISH HER2/CEN17 probe in interphase and normal chromosome 17 produces two HER2 signals and two chromosome 17 signals. 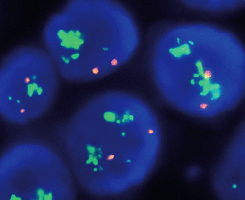 These signals appear green with hybridized HER2 probe and orange when hybridized to alpha centromeric region of chromosome 17, when appropriate filter sets are used. In cases of increased gene amplification in these regions, an increased number of gene signals are visible.